We are all well aware that cart abandonment is a big problem for online retailers. To get a clearer idea of the magnitude of pain that cart abandonment causes e-commerce businesses, let’s take a look at some stats. When discussing cart abandonment, it’s clear that this is a huge problem, but is also a significant opportunity to generate more sales. By focusing on several key conversion marketing tactics to attack cart abandonment, we can increase traffic conversion. The common misconception with cart abandonment is that once a visitor leaves items behind, the sale is gone. This isn’t the case at all. Sometimes people just aren’t ready to buy which leads me to the first way to tackle this problem: Get an email! Since 98% of website visitors do not convert in their first visit, the first step towards getting a sale is to acquire your shopper’s email addresses. Email is the highest converting channel in e-commerce and remains the most direct channel to reach potential customers. 55% of website visitors leave your website within the first 15 seconds of their visit which means it’s best to hit shoppers early on. (Chartbeat) To do this, engage shoppers using an email opt-in promotion. Pop-up overlays drastically outperform other types of email capture tactics because of increased visibility, engagement, and the use of incentives. Present a pop-up promotion to shoppers within the first 15 seconds and attach tangible value to your promotion. Consider running a contest giveaway with one of your products, or offer a discount upfront. Visitors are much more inclined to submit an email when they receive something in return. Now let’s get into how this helps you tackle cart abandonment. If you’re able to acquire the email of an abandoner, you’ve got the means to drive them back to your site to shop again. According to CPC Strategy, abandoners spend 55% more when re-marketed to which means you not only have a chance to drive them to purchase, but they may purchase more from you than they would’ve initially. Since most shoppers who abandon carts express interest in your products, your marketing message gives you a solid shot at driving these visitors back to your site. A great way to drive purchases is to prevent cart abandonment from ever happening. To do this, hit your shoppers with attractive offers at critical points in the purchasing process. Since most purchasing decisions are finalized on the cart and checkout pages, use this critical point to your advantage. Present a promotion on your cart or checkout pages to influence shoppers to complete a purchase. Give shoppers exactly what they want and eliminate the main reasons for cart abandonment. The number one reason for cart abandonment is a high total price because of additional costs like shipping and service charges. Shoppers will leave your site to compare prices with a competitor or search for a promo code. Offer these shoppers free shipping or a discount to keep them on your site and on the path to completing their purchase. 73% of shoppers stated that free shipping was a critical factor in making a purchase and 93% of shoppers are encouraged to buy more products when free shipping is offered. By providing shoppers with the value that they’re looking for, you can satisfy their need for a deal and provide them with a reason to purchase from you at that moment. All of this occurs before they abandon their cart! Despite efforts of driving sales before shoppers attempt to leave your site, sometimes they still slip through the cracks. Here’s where exit offers come into play. 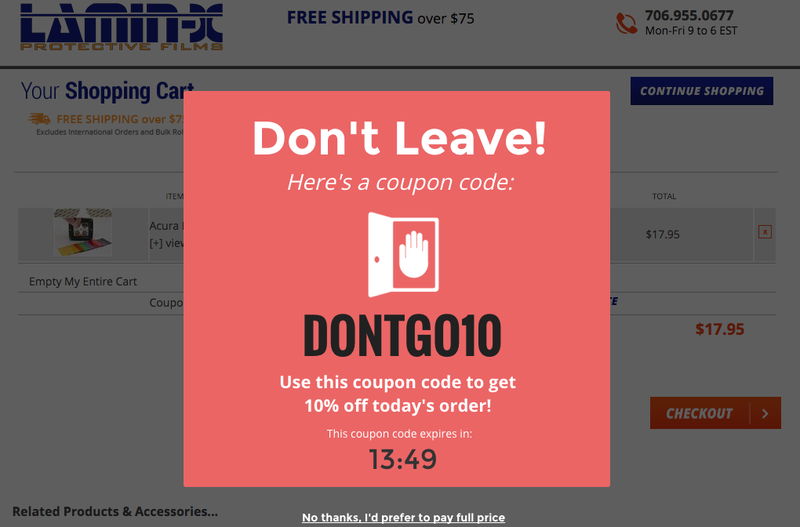 An exit offer is a pop-up that is presented to visitors at the very moment they try to leave your site. This provides one last chance at converting these shoppers into leads and sales. Exit offers are great to use throughout your site but right now, we’re focused on targeting cart abandoners. There are a couple of ways to target shoppers who abandon a cart. First, cart abandonment most often occurs on cart and checkout pages. 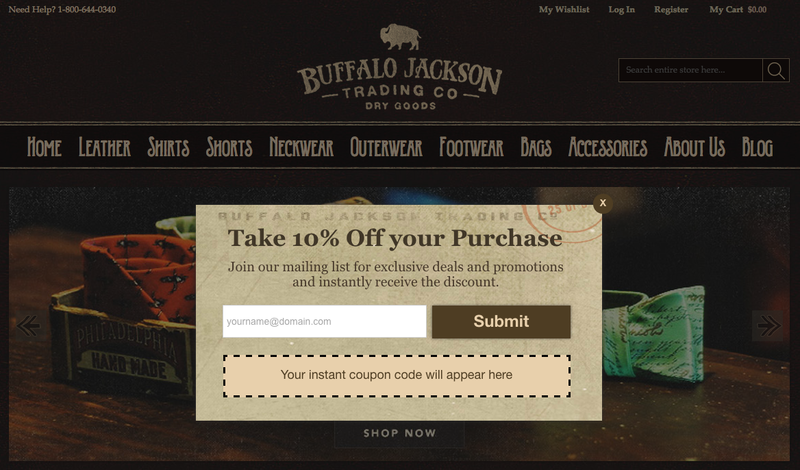 To reach these shoppers, implement an exit offer that is displayed when a visitor leaves the cart or checkout pages. Present a promo code that they can instantly use without submitting an email. This removes all barriers for the shopper and allows them to immediately apply the code to their order. You can also target high-value carts. Using a simple targeting rule, you can present offers to shoppers who have a certain item or dollar amount in their cart. 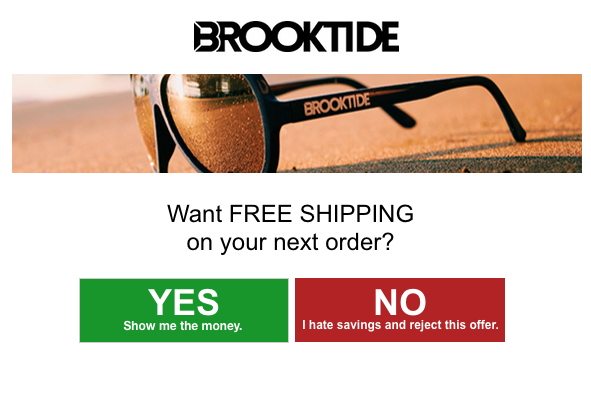 Now you can engage these shoppers with exit offers that have a higher value level. For example, if you normally offer 10% off, you would offer 10% off and free shipping to high-value shoppers. These promotions work because they are exclusive, easily accessible, and display real value to shoppers. There isn’t a single thing in online retail that provides more revenue opportunity than cart abandonment. It leaves a lot of money on the table and a slight decrease in cart abandonment can result in thousands of additional revenue each month. Continue to find the most effective way to convert more shopping carts into sales! All but 2-3% of visitors are going to leave your site without converting into a lead or sale. Don’t just let them leave without a way to contact them. This is like having a great conversation with someone you just met and not asking for their phone number. Sure, you may cross paths again but maybe you won’t. Get a visitor’s email so you have a way of reaching them with your marketing message and sales promotions. Here are some lead generation tactics to use with pop-ups. Free shipping and discounts are the best way to drive a visitor to purchase within that same visit. Shipping is valued highly by almost all online shoppers and discounts have proven to be a viable way to boost sales. Most consumers are actively looking for a deal, so give them what they’re searching for. An easy shopping experience leads to more sales and more repeat customers over time. In order to get the most out of your e-commerce site, you need to be strategic with every move. This includes your promotions. Cater your promotions to high-value shoppers and engage shoppers at pivotal points in the purchasing process. This means exclusive discounts and pop-ups on cart and checkout pages.